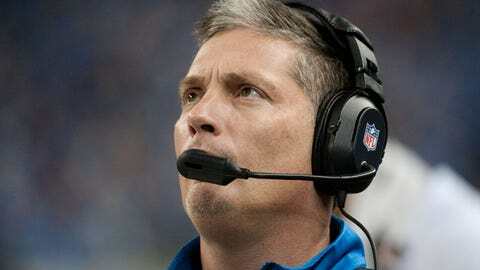 Jim Schwartz's job appears to be on the line in these final two weeks of the NFL season, and his players know it. 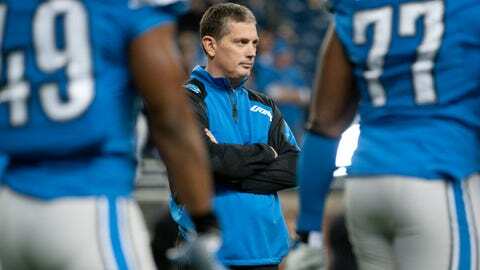 ALLEN PARK, Mich. – Detroit Lions coach Jim Schwartz’s job appears to be on the line in these final two weeks of the NFL season, and his players know it. "Am I playing for Jim’s job?" defensive tackled Ndamukong Suh said, repeating the question. "I think that’s a part in it. Everybody wants to win. Owners expect winning. Football rage has hit Detroit yet again following the Lions' crushing loss Monday night. "I don’t want that coach to go anywhere. I love his scheme." "No question, I don’t think our record shows to how well we should be as a team," he said. When he was asked if coaching was a factor in that underachieving record, Suh answered, "I don’t know. That’s not my decision." "We definitely haven’t been as disruptive and effective on the game as we possibly could," Suh said of the defensive line as a whole. "I didn’t play my best game (in Monday’s 18-16 loss to Baltimore). I don’t think the guys next to me on my defensive line played their best game." "We’ve let go of an opportunity to put these other teams away," Suh said. "We opened the door back for them. "We still have an opportunity to take care of business. It’s most important that we do our part or none of it matters. That’s what we’ve yet to do to this point is do our part, close the door. "We’ve let a bunch of ants in the house. Now you’ve got to go get an exterminator to get them out." Running back Reggie Bush went so far as to call Schwartz "a disciplinarian." "It could be from penalties or it could be from turnovers or it could be how we finish the games in the fourth quarters," Bush said. "It’s not one specific play or moment in the game. It’s the total game. It’s not a coaches’ thing. It’s a players’ thing. "It’s not a coaches’ thing. It’s a players’ thing. We can do a better job all across the board. "From an offensive standpoint, turning the ball over, that’s a discipline issue. That’s something we have to correct because, as you see, it can lose you games." As for the type of disciplinarian that Schwartz is, Bush said, "He really focuses more on the football field and making sure that we’re doing the right things on the field, especially in practice." "If we don’t do what we need to do then there will be some furniture moving around here," Burleson said. "People are going to find someone to blame. If they want to blame somebody, blame me, blame us." "At the end of the day, it’s up to the players to be able to execute," Mathis said. "It falls on us. "When you don’t do as good as the front office thinks you should, there’s going to be a lot of shakeup. But if we finish strong, we know it could be a whole new outlook on this season." "Coming off one of my best games (against Green Bay on Thanksgiving), I felt like I had my swag coming back to me," said Slay, who has had a difficult transition to the NFL in his rookie year. "But it’s going to stay here." Slay said he didn’t know if he will be able to play again this season. "I’m just trying to come back as fast as I can," he said.